My coach had decided that I should do a couple of local sportives if they fitted around my plan to get some practice at having an organised ride with fuelling stops. So I entered two, Sarn Helen Sportif and between the two Outlaws an Evans Cycles Cotswold ride. In the week leading up to my ride Bike Science contacted me and ultimately, my AiR frame, which has had an issue with the rivets in the braze-on dérailleur hanger where the rivet had popped, needed to go back to Boardman and I was asked to avoid riding it. They’d tried a repair on it but ultimately the rivet wasn’t holding and the flex was causing too many issues with the dérailleur making it impossible to avoid chain rub at the high and low gear extremities. I say high, this was purely theoretical as I rarely get there in a ride!!! So the bike has been stripped down and sent back to Boardman under the frame warranty. So far no complaints with the service, I’m just hoping it gets turned around quickly. Biggest snag was that having entered the sportive already I faced having to do it on my turbo bike which hasn’t been removed from the trainer in 9 months since I got the AiR. So Saturday morning, after my long run (reverse of last weeks 17K done 4 minutes quicker – fresh legs make a world of difference) I set about seeing how race ready the bike was. 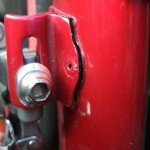 First job was getting it off the trainer which seemed to have seized but once that was done I set about the bike itself. Gears seemed fine but the main job was moving the 8 speed cassette from the turbo wheel onto my normal riding wheels – either way I had the change the cassette or the tyre and I’d rather use the wheel I normal use. 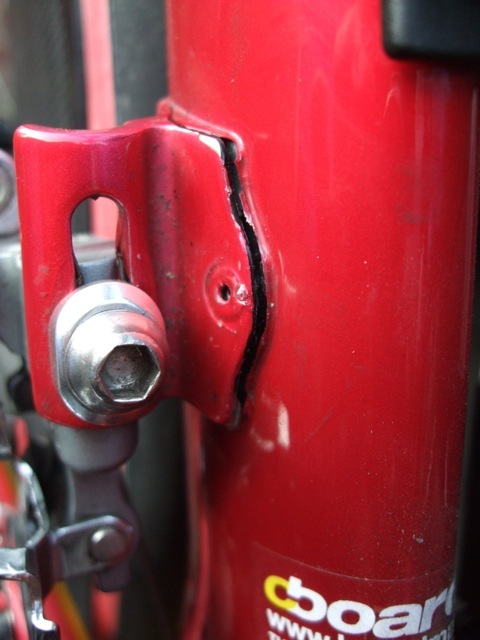 First problem then was the rear hanger wasn’t pulling back and so when free wheeling in low gears there was no tension on the chain and it would fall off, that problem solved the rear brake was jamming (not been used in a while) but again resolved easily enough. Ultimately it came down to me not really having any excuse so on Saturday afternoon after watching Palace clinch a play-off place we set off the the in-laws who live 2 miles from the event start. This was going to be a slightly shorter ride than my longest but with comfortably the most climbing and I set off taking it fairly easy having no real knowledge of the big climbs on the route. 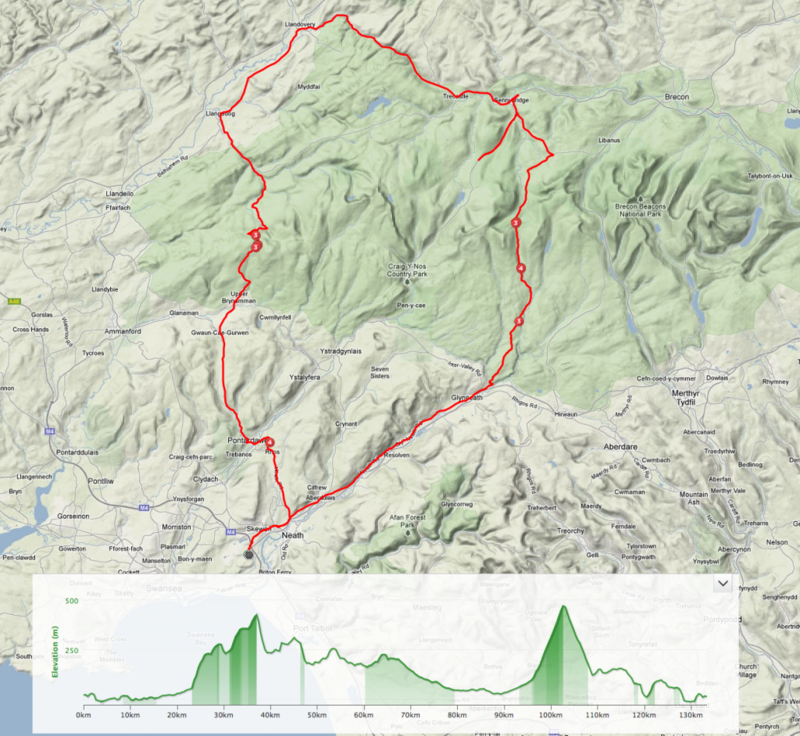 The ride heads up along the Neath valley before the first climb along the Sarn Helen road towards the “Devil’s Elbow” – this was pretty tough but more that it was relentless than any really steep sections. A quick water stop at the top and I went over the other side. The Elbow itself is the tough climb but we were going down it and my usual nervous descending skills came to the fore. A group were following me but seemed happy to stay there but two people came by us all doing what must have been 70kph on a narrow bumpy surface. Rather them than me. Sarn Helen 80 – plus some for luck! Shortly afterwards I managed a wrong turning near Sennybridge and ended up doing 3 miles uphill before realising my error – I turned around and back tracked to the proper location – picking up the road I was supposed to be on further along felt like cheating. I’d managed to do 6 miles extra and lost myself 28 minutes. Looking at the results that time alone actually cost me 20 places and I would have been top third. Back on the right route we faced a head wind all the way to Llandovery, on what should have been the easy section of the ride, so much so that on a long descent it felt like riding into a wall and I was barely able to creep over 32kph. Brief stop to Llandovery and we set up towards the Black Mountain. My legs were already tired at this point and I ended up following a couple from Celtic Tri for 30 minutes or so (always at a tri legal distance I might add) before going past them as soon as the slopes started. I quickly found myself in the easiest gear (one advantage of the triple I suppose) and made my way slowly up but with the cadence barely hovering around 60. Not knowing the road well (I think I’ve driven it once many moons ago) I just didn’t know where the top was and every time you’d hit a switchback you’d realise there was another tier above. Got up there eventually to find an abandoned drink station with just some large drink containers and so rolled over and down. The descent was nice enough but as usual I’m never going to make up the time some daredevil riders might. Home straight now and we rode down the Swansea valley before a final climb up and over Neath and back to Skewen. Two miles from the finish I lost a cap from my tool bottle holder and stopped to retrieve it – tired legs cause me to unclip a fraction late and I fell in the road banging my elbow. Pride hurt more than anything and the following car, who was thankfully a fair way back, seemed pretty confused by what had happened. A decent event, lacking in a few marshalls, but the usual camaraderie was there even if I did spend large sections without seeing another cyclist. With my wrong turning I ended up beating my longest ride PB, albeit at a much lower average speed, but I did take my climbing PB from 944m to 1639m which I make over a mile up. No wonder it hurt – I guess that makes it more climbing for the distance than IM Wales?